A. Looking west, just east of Chimney Rock. The Southwest Freeway can be seen at right. Photo taken 8-September-2001. B. Looking west at the Fountainview/Renwick intersection. Westpark Road will remain as-is; the tollway will be built on the left side of this photo. Photo taken 8-September-2001. C. Looking west at US 59, the Southwest Freeway. The Westpark Tollway main lanes will be depressed in a trench through this section. Photo taken 8-September-2001. 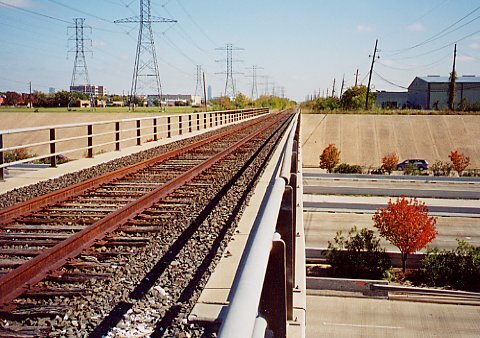 D. Looking west along the Westpark corridor from the Southwest Freeway overpass. 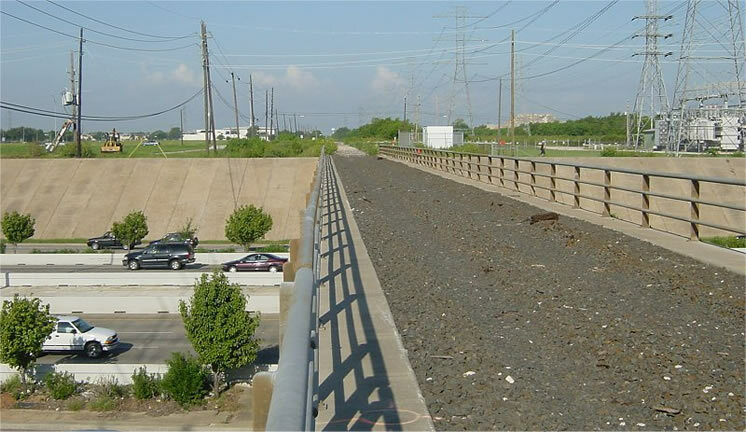 The Westpark Tollway main lanes will be in the north half the the right-of-way; that is between the railroad bed and the existing Westpark Road. 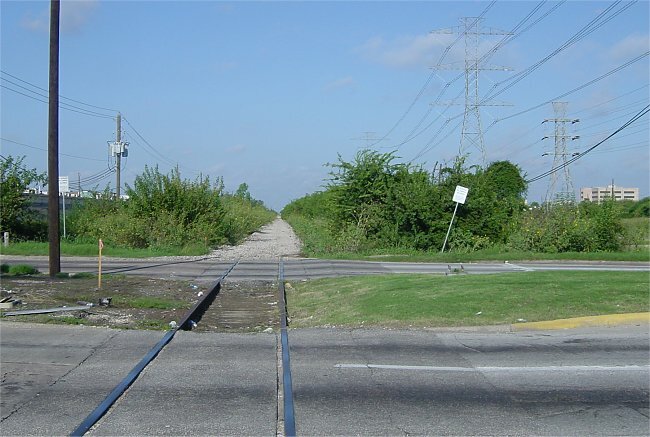 The south (left) side of the railroad right-of-way will be kept clear for a potential future rail line. Photo taken 8-September-2001. 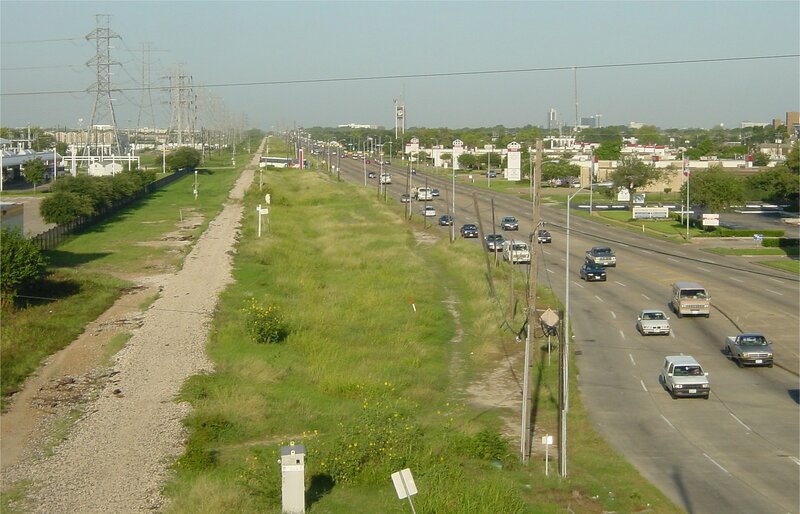 E. This view from the Southwest Freeway overpass looks west along the centerline of the existing Westpark Road. Westpark road will generally remain intact as-is, although it will be modified in certain locations for access ramps and tollway main lanes. Photo taken 8-September-2001. F. Looking west at the intersection with Fondren. Westpark Road will remain as-is at this location; the tollway will be built to the left. Photo taken 8-September-2001. G. Looking west between Fondren and Gessner. Preliminary plans showed that the tollway would take two lanes from Westpark Road in this section. I don't know what the final plan is. Photo taken 8-September-2001. H. Looking west along the corridor at Gessner. Photo taken 8-September-2001. J. 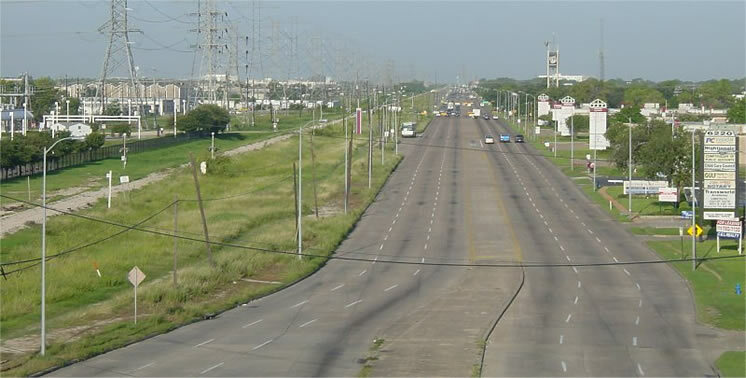 Looking north along Beltway 8/Sam Houston Tollway at the location of the Westpark Tollway. 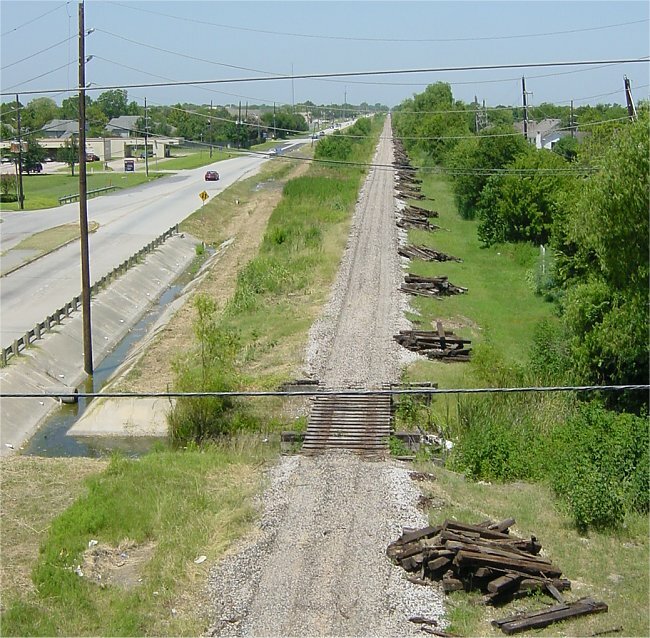 The Westpark Tollway will be built at the location of the existing railroad bridge. 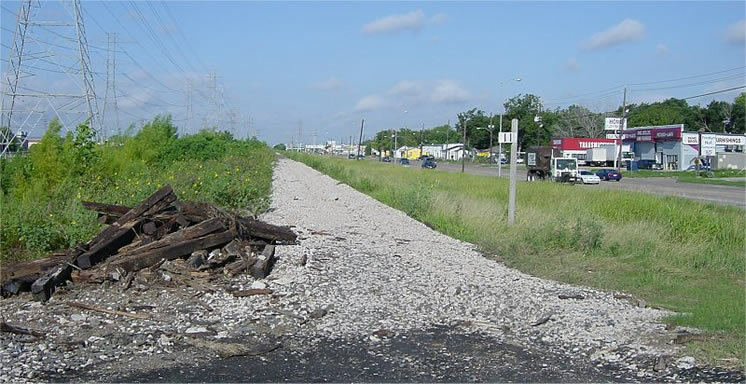 The new northbound feeder road will be located on the location where this photograph was taken. The existing northbound feeder in the trench will become part of the connection ramp. Photo taken 8-September-2001. K. Looking west along the corridor. Photo taken 8-September-2001. L. Looking east along the corridor. Photo taken in late 2000. M. Old Westheimer Road. Photo taken in late 2000. O. Looking west along the corridor, just west of Eldridge Road. The highway 6 overpass can be seen in the background. Photo taken in 21-July-2001. P. Looking west along the corridor from the highway 6 overpass. Photo taken in 21-July-2001. Q. 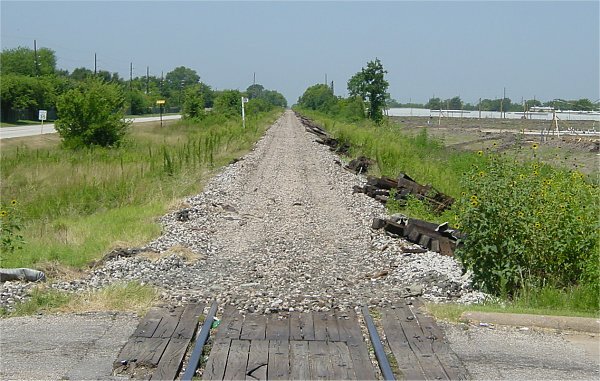 Looking west along the corridor at Addicks-Howell. Photo taken in 21-July-2001.